If you are a regular TV watcher, then I am sure that you have probably seen the commercials for Buitoni’s frozen ravioli by now. I had seen the commercials, but I wasn’t really tempted to try it until I read a review by Deborah over at Italian Food Forever. Buitoni asked her if she would be willing to review their frozen pasta dinners. At first, she was hesitant about doing this. She then decided that she, a self-described “pasta snob”, would be the perfect person to review it. Deborah said that she was pleased with the product, and felt that it would be a good dinner option for two people. She reviewed two different pasta dinners, and one of the ones she chose was the Shrimp and Lobster Ravioli that I tried. You can read more of her review here. Since she didn’t totally hate it, I decided that it would be worth trying. After a long workout one night, I thought it would be a good time to give it a try because it basically takes five minutes to make. Can’t beat that! Here is what comes in the box. A bag of frozen ravioli and one packet of garlic butter sauce. 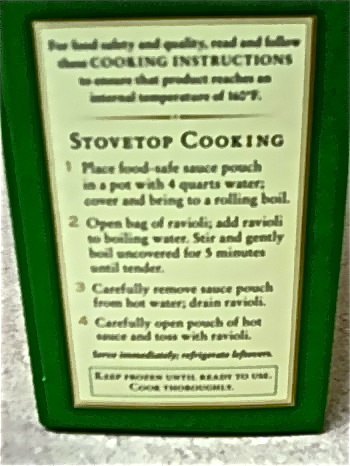 Now, the instructions on the side of the box say to put the sauce pouch into the pasta water and heat it up along with the pasta. I don’t like the idea of the cooking my food in plastic, so I did things a little differently. I cooked the pasta according to package directions, but I heated the sauce in the microwave. First, I ran it under some warm water for a couple of minutes to make it easier to remove from the plastic. Then, I placed the still-frozen sauce into a bowl and microwaved it for about four minutes. The sauce seemed a little thick to me, so I put a a couple of tablespoons of the starchy cooking liquid into the sauce to thin it out a little bit before I added the pasta. Again, this was different than package instructions, but it worked out great. 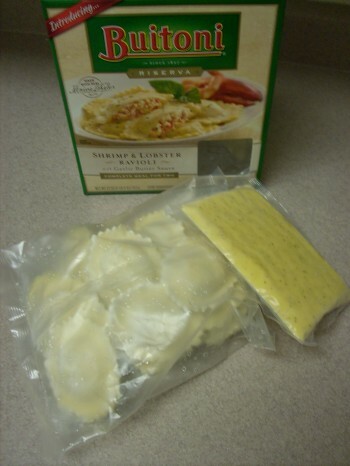 The ravioli are large, and when you cut into them, you can actually see the pieces of shrimp and lobster. The garlic butter sauce doesn’t overpower the flavor of the seafood – you can still taste the shrimp and lobster. The pasta comes out perfectly al dente when cooked according to the package instructions. This makes a great main course for two people, especially if you aren’t proficient (like me) in making your own pasta by hand. I wouldn’t consider this low-fat by any means at 16 grams of fat per serving, but it’s a better option than a hamburger and fries at the end of a busy day. Throw in a salad or sauteed spinach, and you have a complete meal for two. 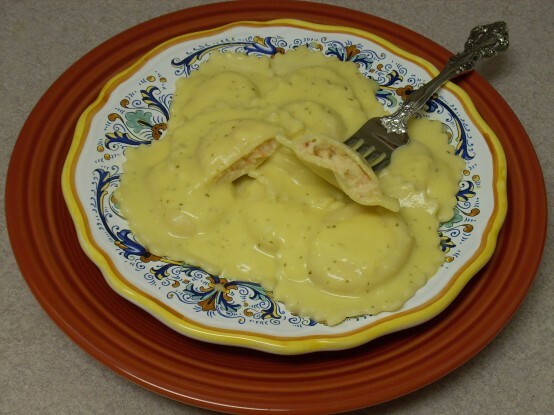 I have only tried the Shrimp and Lobster Ravioli, so I can’t vouch for the other pasta meals. My husband and I were both pleased with this one. Have you tried any of Buitoni’s frozen pasta meals? If so, which ones, and what did you think about them? Note: My personal opinions expressed above are just that. I paid for this product myself, and Buitoni didn’t ask for my review of it. By Tempie at May 27, 2011 . I haven’t tried the frozen meals–in fact, I never realized they had any! The Buitoni ravioli I’ve gotten is always in the refrigerated section. I think those are pretty good–my kids love it. I’ll have to look for these now, too!